In the last post I described Henri Maillardet’s Automatical Museum, a display of automata. Maillardet worked for Henri-Louis Jaquet Droz, a Swiss expert in clockwork mechanisms. 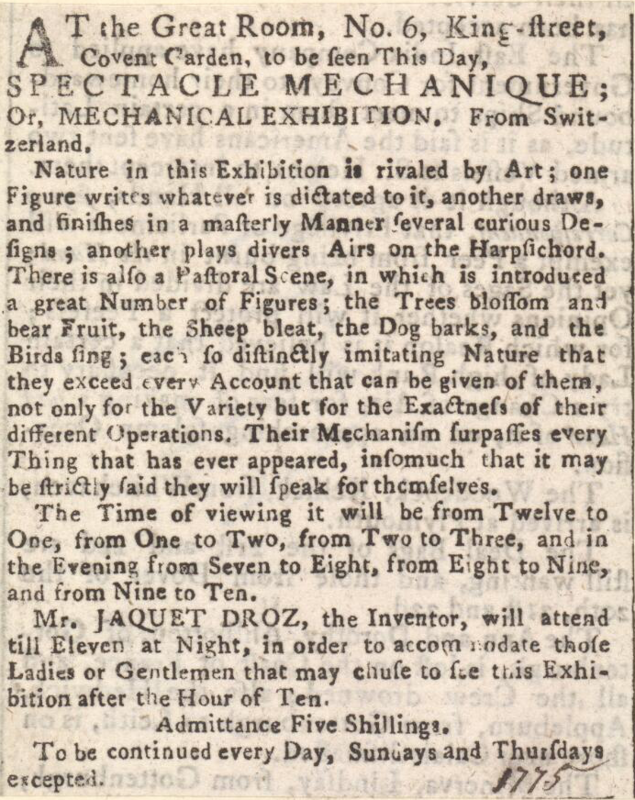 Maillardet’s was not the first such show in London, as in 1775–6 Jaquet Droz himself presented a Mechanical Exhibition there. At the Great Room in King Street, Covent Garden, the show comprised three automata and a mechanical picture of a Pastoral Scene. Such pictures had been seen since the early 18th century, with the first in London shown by William Pinkethman at the Duke of Marlborough’s Head in Fleet Street in 1709. Jaquet Droz’s picture was about four and a half feet square and showed a palace and formal gardens with fountains. Above and behind the palace was a grotto with many miniature figures including a shepherd and shepherdess playing music, grazing sheep, singing birds, and fruit trees which blossomed and bore fruit. But the main attraction of the exhibit was probably the three automata: a writer, a draughtsman and a musician, who played ‘divers Airs on the harpsichord’. The exhibition was not cheap to enter. 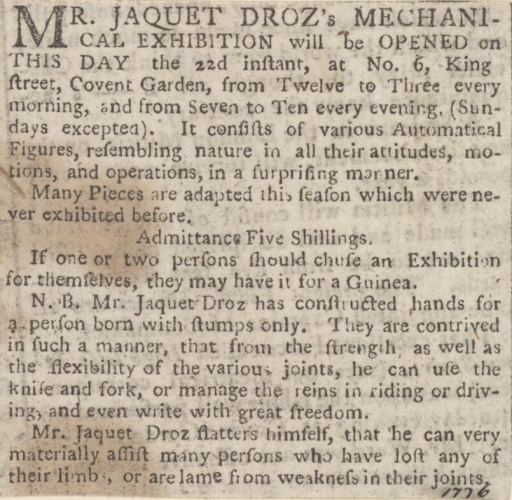 The five shilling admission would be probably over £20 today, but in 1776 Jaquet Droz also appears to have offered private viewings of the show for one guinea, roughly £95. At the same time Jaquet Droz was also advertising his skills in prosthetics, having constructed artificial hands for someone born without them, flexible enough to use cutlery, ‘write with great freedom’, and manage the reins of a horse. Some of Jaquet Droz’s automata are still on show at the Musée d’art et d’histoire Ville de Neuchâtel, Switzerland. The adverts are in the collection of the Bodleian Library, shared under a Creative Commons Licence.